Everybody wants the best: The best carrot, the sweetest apple, the juiciest tomato, the biggest yam. But pretty isnâ€™t everything. We all know that looks deceive. Earlier that afternoon, while making lunch, I had sliced into an eggplant and found a whole worm embedded in the middle. I cut around it and proceeded with my cooking. Tonight, Iâ€™m going to make a tofu stir-fry with some greens I picked up at the Queenâ€™s place. I did the spot check (above), and we should be just fine: lots of little holes. Love the worm. Itâ€™s your friend. This is a philosophy alien to America’s neat-bordering-on-prissy food culture. I must say, within the last 24 hours I have heard of two people who got very ill eating street food, one from Mexico, the other Albania. Perhaps if the bugs had shown interest first, they could have a better idea that is was not going to make them ill.
I’m so glad you say that too, because it’s what I always tell people – if your veggies have some insects like worms or bugs on them, that mean it’s probably less lethal than the ones that are flawless. 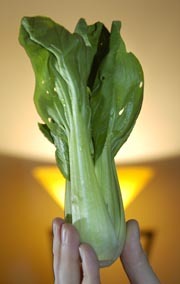 The other night I found a lady bug in my bunch of lettuce. I opened the door to let it out and it made me strangely happy. THANK YOU so much for writing this. It is very good to know. Have you done much research (besides just speaking with that lady) about the pesticide use in thailand? I have heard it is quite bad. I don’t want to buy strawberries and grapes here because I think they are also loaded with pesticides, and not native to this land. Even the seller of the fruit (who is someone I’ve known for several years) cautions me about buying the grapes and tells me to wash them extensively before eating. That scares me. Any thoughts or experiences since the talk with that lady? I have heard from many sources that some fruits in Thailand are heavily doused with pesticides. In particular, Thais and foreigners have cautioned me against strawberries, grapes and oranges/tangerines. When we lived in Chiang Mai, I shopped as often as possible at the Royal Project store. I also have met several of the farmers who sell to the Royal Project. Although their produce is not entirely organic, safe and healthy food is the ultimate goal, and anything sold with the Royal Project label is carefully inspected. You can find these and other organic foods in many of the larger supermarkets and wet markets. Otherwise, I tried to stick to the same general ideas as I do anywhere: buy produce grown as close to market as possible, avoid imports (especially from China) and non-native foods, ask the locals what’s fresh and best.